What makes our neighbourhoods worth investing in, staying in, and loving? We know when we visit a healthy neighbourhood or not. We intuitively seem to sense if we feel safe or welcome, and we know right away if a neighbourhood is a place that we could see ourselves rooting down over the long-term, or if it is a place we would really rather leave. Great neighbourhoods are so important, but what makes them so? Emily Talen, a professor of urbanism, has offered helpful insight into what makes for a great neighbourhood. She calls it the “Everyday Neighbourhood” and it has eight vital qualities: First, a great neighbourhood has a name. Secondly, residents know where it is, what it is, and whether they belong to it. Thirdly, It has at least one place that serves as its center. Fourthly, it has a generally agreed upon spatial extent. Fifth, it has everyday facilities and services, although it is not self-contained. Sixth, it has internal and external connectivity. Seventh, it has diversity within it, or is open to its enabling. Ninth, it has a means of representation, a means by which residents can be involved in its affairs, and an ability to speak with a collective voice. This is what we might call a recipe for a remarkable neighbourhood. A place we can name, know, get involved in, welcome each other, go about our work and play, gather together, and travel in, out, and around it freely. What do you think of these eight characteristics of an “Everyday Neighbourhood?” Do they reflect your hopes and dreams for your own community? 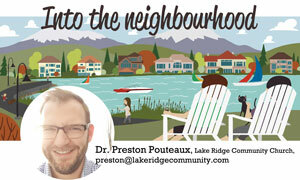 Some neighbourhoods in Chestermere are easy to define and point out, some are not. Some neighbourhoods have a clear gathering place and centre, while others might not even have a playground. When you think about the recipe for a remarkable neighbourhood, how does your neighbourhood stack up? While we might thank developers or planner for first designing your neighbourhood in a way you appreciate, the truth is that we can continue to build remarkable neighbourhoods here in Chestermere. We can create community associations that advocate for those who live nearby, we can offer helpful feedback when our city planners ask for it, and we can demonstrate that we love our neighbourhoods by using them well, caring about them, and coming forward to help make decisions. Community takes effort by those who live near one another. When we come together and craft a recipe for a remarkable neighbourhood, our dreams might look differently, but they will be similar. Together we can find what we appreciate about our current neighbourhoods and find new ways to express our hopes for the future. Our neighbourhoods are not static, but places that grow and change over time. May we be the kind of city that builds amazing new neighbourhoods and works together to make our existing neighbourhoods special for everyone.